So near but so far: on Thursday Irishman Nicolas Roche came within a whisker of taking his first ever stage in a major Tour – but Spaniard Imanol Erviti pipped him to the line. ?It was my big chance in this year?s Vuelta,? a deeply disappointed Roche said afterwards. ?Opportunities like today?s don?t come round so often.? 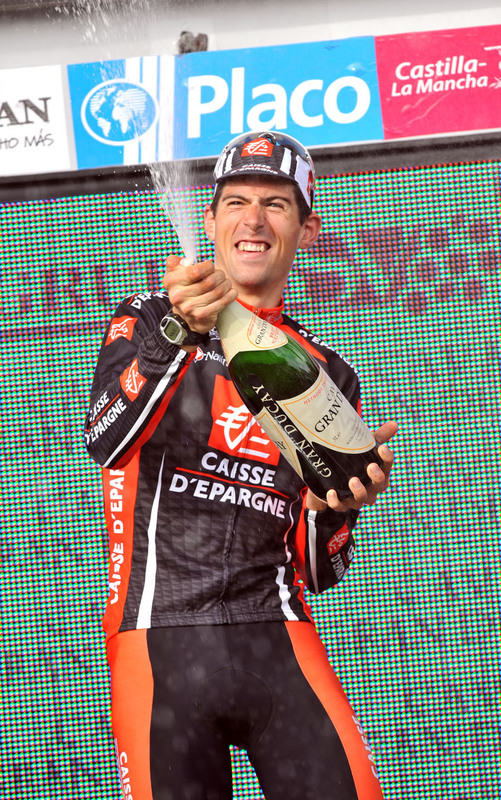 Roche was part of a break of 18 that took off early on the 167 kilometre transition stage from Valladolid to Las Rozas. After such a big group had broken away and race leader Alberto Contador?s Astana team had shown no interest in chasing, it was a virtual certainty the 18 would reach the finish ahead of the main bunch. With a strong head-wind initially keeping the move together, the working alliance between the 18 held until the last 20 kilometres or so before the finish in Las Rozas. But from then on, it was total war for the stage win. The final half-hour’s racing saw a non-stop flurry of attacks, made principally by those teams with two riders in the break – Credit Agricole (Roche and Cyril Lemoin), Caisse D?Epargne (Erviti and Jose Luis Garcia Acosta) and CSC-Saxo Bank (Inigo Cuesta and Karsten Kroon). The presence of World Champion Paolo Bettini (Quick Step) and Juan Antonio Flecha (Rabobank), both of them chasing down moves and occasionally trying to go clear themselves, further complicated matters. But as soon as one attack was brought back, yet another formed – and was equally quickly squashed. It might be total war, but it was also total stalemate. Curiously enough, just like on stage 15 to Ponferrada, the most successful move was made by a rider from the smallest team on the race, Xacobeo-Galicia. Close to Las Rozas, sprinter David Herrero opened up a gap of a couple of hundred metres that took him almost to within sight of the finish. But Roche and Erviti made a counter-charge that took the two clear on the final corner – and of the 18 men in the breakaway, suddenly only one of these two could win. Roche led out the sprint on the long, draggy uphill from 450 yards to go. Slowly but surely, Ervit clawed his way back and past the young Irishman for the victory. Had it been a little further, Roche would have regained momentum and perhaps taken the stage. As it was, he had to settle for a deeply disappointed second. ?I wasn?t sure if I ought to have had a go today [stage 18] or tomorrow [Friday],? Roche said afterwards. ?I actually wasn?t feeling so great at the start, but I ended up in the move.? ?Cyril [Lemoin, C.A team-mate] had done such a good job chasing down the attacks, I had to have a real try. But it was very close.? If Roche was gutted by such a narrow defeat, it?s perhaps some consolation that he?s now moved into 13th place overall – an excellent result for a 24-year-old rider doing his second major Tour. As for Erviti, he was predictably delighted with the first victory of his three year career. ?It was so close I didn?t dare raise my arms? Erviti said. ?I had no idea that I had won until a radio reporter told me. But to get my first win in such a big race – that?s something special.? The only other big news of the day was Tom Boonen?s planned abandon of the Vuelta after taking two stages. The Quick Step leader will build up for the World Championships back home in Belgium. 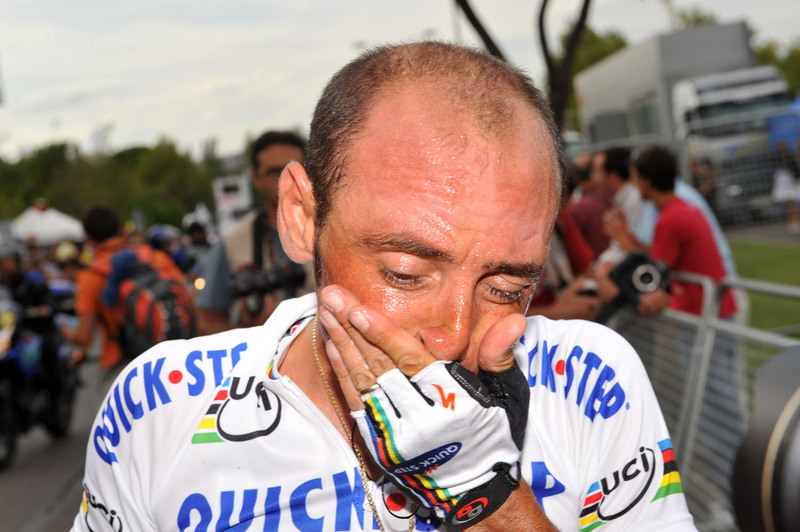 Team-mate Paolo Bettini is expected to follow suit tomorrow. After today?s transition stage, Friday?s 145.5 kilometre trek through the sierras of Madrid should see the gc favourites swing back into action. The two first category climbs that feature on the course are a long way from the finish in Segovia, but the undulating terrain that follows and a steep uphill section in the final kilometre could be good for surprise attacks.